(CNN) - Color North Carolina light red. CNN is moving its classification of the swing state from true "toss up" to "lean Romney." Four years ago then Sen. Barack Obama became the first Democrat since 1976 to carry North Carolina in a presidential election. And this summer the Democrats held their nominating convention in Charlotte. While the Obama campaign continues to run ads in North Carolina, spending just over $1.2 million to run spots over the past week, according to Campaign Media Analysis Group, which tracks ad spending for CNN, the president hasn't made a campaign stop in the state since his nomination at the Democratic convention in early September. Last week, in a clear sign it's confident about turning the state from blue to red, Republican nominee Mitt Romney's campaign moved its North Carolina spokesman out of the state and planned to shift more staffers to other states. This week the Obama campaign denied that they were giving up on North Carolina, saying they have a "credible pathway to 50%" in the state. But some campaign officials privately acknowledge that the state, which Obama can afford to lose, is moving out of reach. With the shift of North Carolina, CNN now estimates that Romney is leading in states with 206 electoral votes. 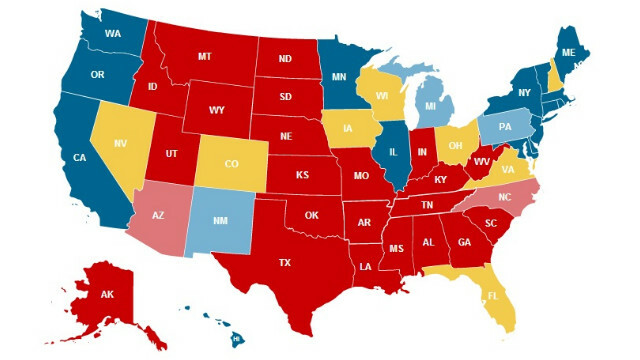 The shift does not affect CNN's estimate that Obama is leading in states with 237 electoral votes. Two-hundred and seventy electoral votes are needed to win the White House. CNN is also shifting Indiana and Missouri, two states that are currently "lean Romney," to "safe Romney." Obama carried Indiana four years ago, becoming the first Democrat since 1964 to win the state in a presidential election. And he narrowly lost Missouri to Sen. John McCain, the 2008 GOP nominee. But this cycle, the Obama campaign has not seriously contested either state. The moving of Indiana and Missouri does not affect the electoral count. @merrilltech - not everyone in America at the time was in favor of the American Revolution. As a matter of fact it was a small minority that was the core of the movement. They were labeled radicals and extremists and it was only when it appeared they just might have a chance of pulling it off that they started to get support....kind of like what we're seeing from "Independent voters" of today. Sure hope this doesn't stay this way. The middle class is in a heck of a lot of trouble if Romney gets elected. What's amazing is that anyone who is not part of the elite can possibly think that any Republican politician gives a darn if they live or die; they don't. Sorry but I can't imagine how anybody on God's green Earth thought Obama was going to get North Carolina this time around. Somehow nobody seems to have picked up on this but wasn't it clear? He gave up on North Carolina in favor of Florida 'cause he's going for a clean sweep of "The Big Three." (FL, OH, VA.) i.m.o. *that's* why he endorsed gay marriage – to pick up the vote of the many gay persons in Florida. In terms of Electoral Votes only, I think that was a gamble worth taking. With all the republican obstruction, how do we know if that is even true? After this election.. I think I would like a recount.. A show of hands of all who found for whatever reason they could not vote. Or who's vote simply did not count. Who really cares what cnn does? They have become just another liberal biased outfit, too bad they haven't learned that American can spot their nonsense a mile away. They are just becoming another msnbc, even they have better ratings than cnn. North Carolina, you are being fooled. WAKE-UP!!! Romney is an empty vessel. He will say anything to get elected.